Yep, another page in my documented life journal. This week's theme is to drawing a face. Well that was right up my street. 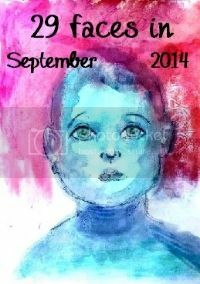 Though thinking about the upcoming 29 Faces in September Ayala is trying to encourage everyone to step out of their comfort zone with their artwork. I didn't sketch in pencil today and it is all done in pen/plus the shading, I coloured with Gelatos. You will noticed I sneaked on a couple of Sara Naumann's new stamps too. I know it isn't quite September yet but decided to get into that way of thinking now! I know I won't keep up with 29 Faces this time because of the start of the new school term but going to do as many as I can and keep the phrase...'but never dared' in my head. Super sketch. She looks sad in a kind of way... maybe it is just she reminds me of someone. The bold red hair is brilliantly done. 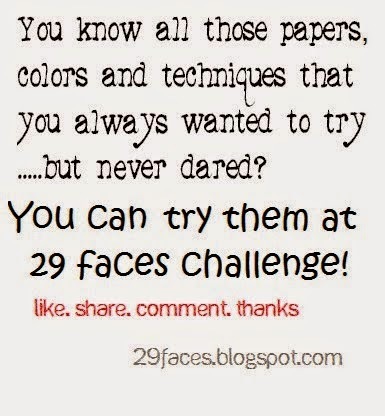 Go for it with the 29 faces Sept challenge. Even if you only get time for 1 or 2 it will be fab to see them again :-) Sounds like it could be a lot of fun combining papers and colours that you really don't think go together. wow gorgeous face, beautiful card!